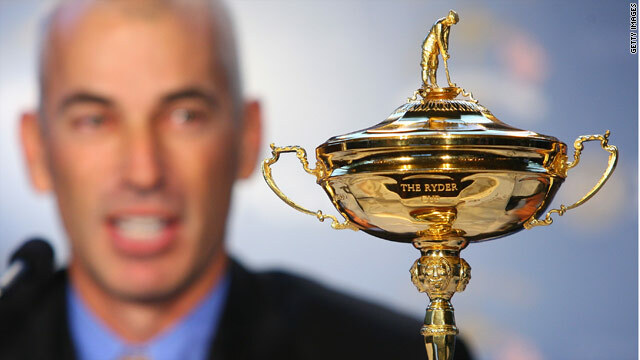 Corey Pavin will captain the U.S. team at the 2010 Ryder Cup at Celtic Manor in Wales. (CNN) -- The 38th Ryder Cup will be held Oct. 1-3, 2010, at The Celtic Manor Resort in City of Newport, Wales. PGA.com Interactive Producer T.J. Auclair provides analysis of the top 10 U.S. players in the latest standings. Riding a white-hot streak leading into the Players Championship, it's safe to say Lefty was probably hoping for a little more than his eventual tie for 17th. It looked as though Mickelson might make a Sunday run after a splendid 6-under 66 on moving day helped him soar up the leaderboard. However, the Masters champion couldn't get anything going on Sunday, settling for a 2-over 74. Even so, he's still an overwhelming No. 1 in this week's standings. As predicted in this very space last week (patting self on back), AK decided it was time to step away to have surgery on his injured left thumb. He withdrew from the Players and will likely miss the next 10-12 weeks which means no U.S. Open and probably no Open Championship. All of this is in an effort to be healthy in time for the Ryder Cup. There's no denying the fact that AK's priorities lie with the Red, White and Blue. Now he just has to hope his standing doesn't free fall. That, however, is out of his hands until he returns. TPC Sawgrass is Furyk's home course. Because of that, I was hoping to see him muster a lot more than his tie for 47th, which turned out to be his second worst finish of the season. On Friday and Saturday, he shot 1-over 73. On Sunday, he made a double bogey on the final hole for - you guessed it - his third straight 73. The final tally was disappointing, but there's no need to worry about Furyk. He'll be just fine. Now there's the Lucas Glover we saw win the U.S. Open last summer! Glover finished third at the Players for, by far, his best finish of the season. That helped him jump two spots in the standings this week to No. 4. As good as it was, Glover can leave Ponte Vedra Beach with two very different thoughts: 1. What could have been? On Sunday, after a par at the first hole, he made bogey on four of his next five; or 2. That was one heck of a come back! After those four bogeys, Glover made six birdies to finish 2 under for the day. Let's hope he opts for the latter. Mahan is known for his ability to go low and make birdies in bunches, which makes Sunday's final round at TPC Sawgrass so difficult to comprehend. Hunter carded 18 consecutive pars for an even-par 72 and a tie for 17th. In contrast, Mahan had no less than four birdies in each of his previous three rounds last week. Regardless, it was another solid week for one of the young guys who has already proven his worth in a Ryder Cup setting. Citing a sore right shoulder, Stricker withdrew from the Players and dropped two spots this week. Johnson tied for 34th at the Players. He took a double-bogey 6 at the daunting, par-3 17th for a back-nine, 2-over 38 on Sunday, which led to a 1-over 73. I love how this guy is playing lately. He's staying away from the big numbers and it's yielding results. After missing the cut at Quail Hollow - just his second MC of the season - Kuchar bounced back to tie for 13th at the Players. That helped him jump two spots to No. 8 in the latest standings. For the fourth time in six starts, Cink missed the cut at 1 under to drop one spot this week. When it comes to Tiger these days, strange just gets stranger, doesn't it? On the seventh hole Sunday, Woods withdrew from the Players citing a neck injury. At the time, he was 2 over for the day and a non-factor in the tournament. Just to recap the Tiger comeback: a tie for fourth at the Masters; a miserable missed cut at Quail Hollow; a WD at the Players. What's next? Because of the neck injury, we don't know.